The Graston Technique is a soft tissue diagnostic and therapeutic method used for outpatient therapy. It is a excellent method for treating and resolving soft tissue injuries, including repetitive stress diagnosis. The instruments are made of stainless steel, specifically used as an alternative to manual transverse friction massage. 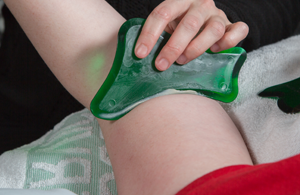 Scar tissue (and/or adhesions) prevent fluid movement of muscles, ligaments and surrounding areas. Thus when someone says they feel tight or have pain with movement, they are experiencing the binding effect of scar tissue.